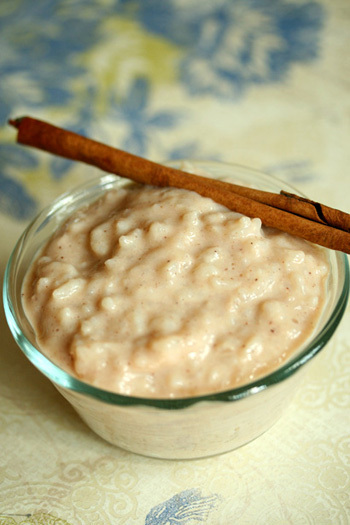 Rice pudding is a world famous dessert and almost every culture has their version. I add coconut milk to mine for creaminess, but the core flavor of this pudding is vanilla. Even people who aren’t coconut fans still dig in. In a large saucepan bring the milk, coconut milk, and cinnamon to a near boil. Stir in the rice and cover. Reduce the heat and simmer, 45 minutes to an hour, stirring often until the rice is tender and most of liquid is absorbed. Stir in the sugar and vanilla and serve warm or cool completely before refrigerating in an air-tight container for up to one week. Nutritional Stats Per Serving (1 cup): 189 calories, 5 g protein, 27 g carbohydrates, 4g fat (3 g saturated), 2 mg cholesterol, 0 g fiber, 55 mg sodium. I tried this recipe and the flavor was absolutely incredible… However, I could not get the rice to soften up (I used brown rice) I cooked it for two hours. I also chilled it overnight to see if that would help, it was still crunchy… Any suggestions? You can add 1/4 cup water and cook the pudding 10 to 15 minutes longer. you can’t use brown rice for this recipe..
Sure you can! Don’t use the long grain brown rice, it will get mushy. The short grain will work nicely but you will need to cook it slightly longer and might need to add more liquid. hi, i just finish making this recipe.. i didnt use coconut milk but i had a can of coconut cream and used half the can! i uesd long grain white rice. it was very tasty!! my boys cant get enough!! Making husbands happy – I LOVE when that happens!